Wernsing Feinkost & Salate is a producer of chilled and deep-frozen foods. 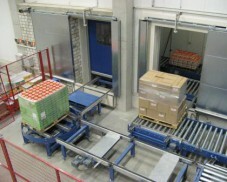 A new storage hall was constructed for the purpose of internal pallet handling, in which the products would be (temporarily) stored. In this instance, flexibility and reliability of pallet data were of the utmost importance. The scope of the project also comprised the delivery of the panels and the wiring of the entire system. A reliable and flexible system was realised by means of an S7-400 controller, with a flexible, standardised software design. 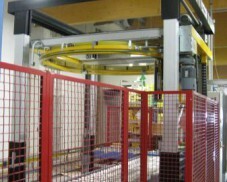 The safety of the machine and operator was guaranteed by means of a separate PILZ PLC control. The approximately 250 SEW motors are now for the most part controlled by means of ASI-bus and the remaining motors are driven by Profibus. This enabled considerable savings to be made in terms of the required cabling and space for panelling. The system is now in full use, and each day, approximately 1500 pallets pass over the conveyors, which consist of rolling conveyors, angle converters, lifts and shuttle wagons. 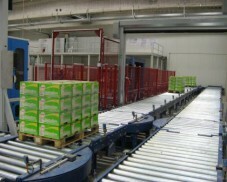 The pallet data are verified during this process by means of 4 barcode scanners.